Every year hundreds of thousands of cars are damaged by hail storms and many adjusters are deployed to estimate their damages and are earning $500 a day, but there isn’t much online adjuster training to help you become a hail adjuster. How to inspect, estimate, and write an accurate estimate in the industry leading auto body estimating software like CCC One or Audatex isn’t something that most adjusters know how to do properly even if they are doing their best. That is why at IA Path we created our Hail Adjuster’s Boot Camp. This online adjuster training was created because we wanted to help you become a hail adjuster that could earn $500 a day the next coming hail season. Having a solid foundation in auto body estimating is essential when stepping foot on a catastrophic hail storm. When there is a major hail catastrophe everything is faster, harder, and more difficult than handling every day claims. Insureds are frustrated, insurers are demanding, and mistakes are costly. 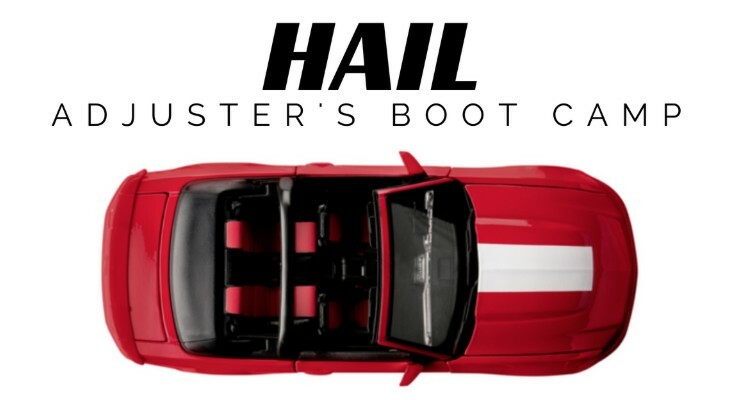 With the hail adjusters boot camp I will give you all the tips, tricks, processes, and insight I gathered over the last 10+ years in the industry. I experienced being an adjuster, hail project manager, and oversaw 100+ technicians repairing tens of thousands of vehicle as an operations manager. I worked with major insurance carriers setting up and executing their auto catastrophe storms and I saw what worked and experienced what didn’t. That experience is what I pass on to you in this course. The Hail Adjuster’s Boot Camp is a 4 day interactive online training to get you ready for the next hail season. If you are ready to become a catastrophic auto hail adjuster earning $500 a day this is the course for you.